I’ve been a consistent Apple Watch user since the wearable first launched back in 2015. While I wasn’t always on board with the Apple Watch as a concept, it’s gradually become an essential staple in my life. 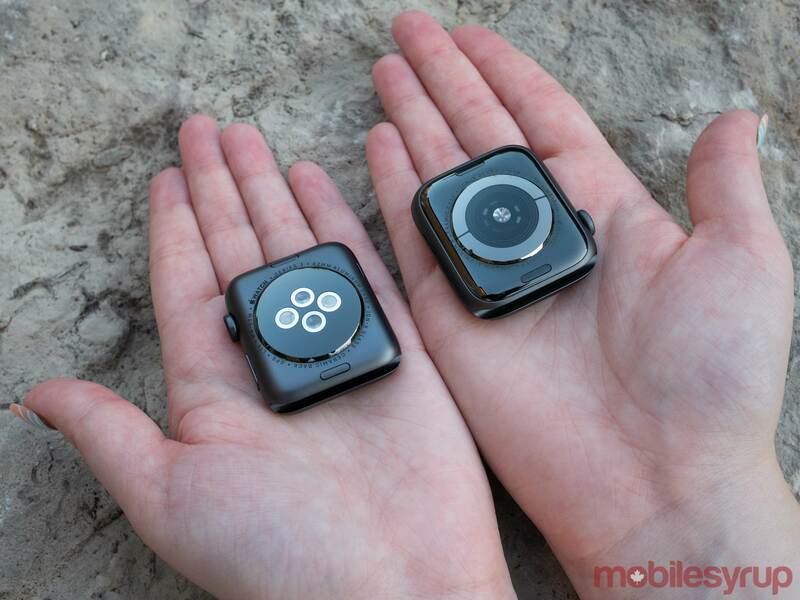 That killer app that genuinely exemplifies the purpose of a smartwatch still hasn’t arrived, and at this point likely never will — but now I think that’s okay. 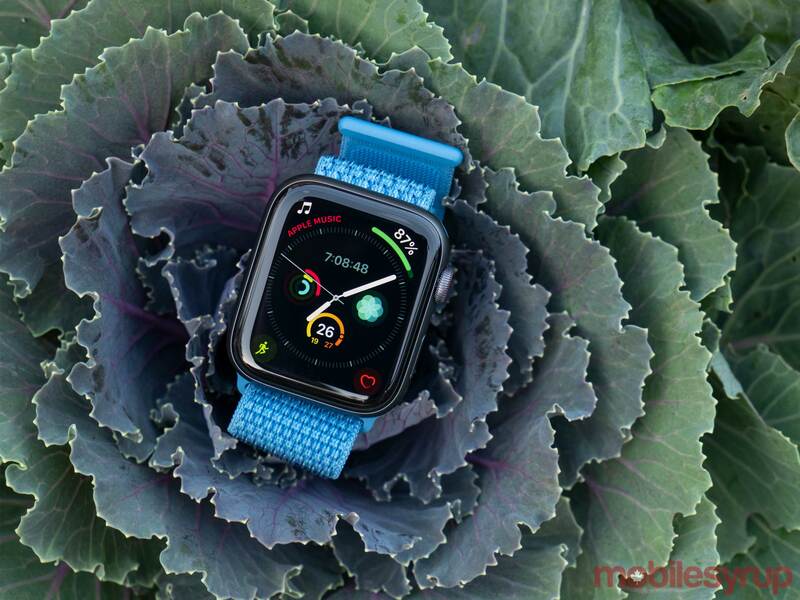 Instead, Apple has pivoted the Apple Watch’s focus to activity tracking and notifications, a move that puts the wearable in direct competition with Fitbit’s devices, as well as the myriad of Wear OS-powered smartwatches out there. Speaking of Wear OS, Apple’s watchOS 5 is leagues ahead of what manufacturers are doing with Google’s wearable operating system, both in terms of stability and functionality, as well as overall look. Enter the Series 4, Apple’s latest and most significant refinement to the Apple Watch formula since it first introduced the wearable. In many ways, the Series 4 is the Apple Watch finally coming into its own thanks to a wealth of new features, including an expanded display and new ECG functionality that isn’t yet available in Canada (more on this later), along with other subtle refinements like the addition of haptic feedback in the Digital Crown. While saying that the Series 4 is a complete reimagining of the Apple Watch would be taking things a step too far, the smartwatch does look distinctly different from Apple’s previous smartwatches. For starters, the new 44mm Series 4 features a display that measures in at 32 percent larger than its predecessor’s screen, while the 40mm Series 4’s display is 35 percent bigger. 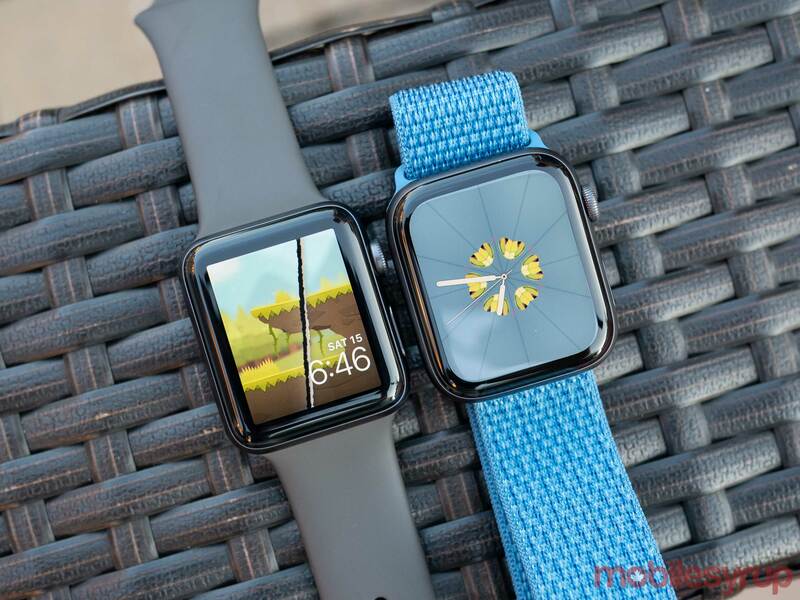 Both new sizes are increased from the 42mm and 38mm options featured in the Series 1, Series 2 and Series 3 Apple Watch. As a result, the 44mm Series 4’s display measures in at 448 x 368 pixels, with the smaller 40mm new Apple Watch coming in at 394 x 324 pixels. This is compared to the previous screen resolution of 312 x 390 pixels with the 42mm and 272 x 340 pixels with the 38mm. While this more substantial, curved display results in the Apple Watch featuring a unique look that makes it stand out from its predecessors, it also gives app developers more display real-estate to work with. Apple told me that most apps will scale up to the larger display, and all of the third-party applications I tested out, including Pokémon Go, Air Canada and Pocket Casts, seem to do this. Apple’s own Apple Watch apps also take advantage of the additional screen real estate. While the larger display makes reading notifications and at-a-glance information more comfortable, I haven’t found that it’s resulted in me using Apple Watch apps more frequently like I predicted it might in my initial hands-on with the Series 4. 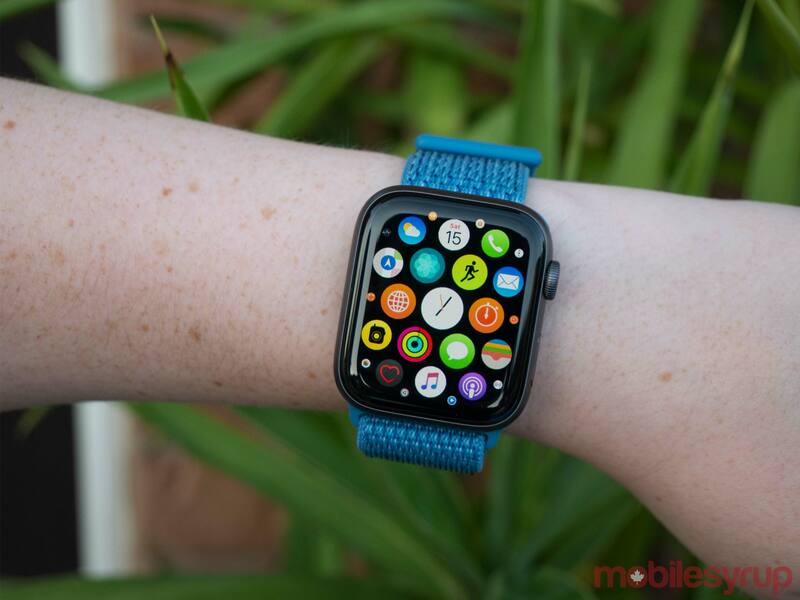 Given how many developers have ditched their dedicated Apple Watch apps over the last few months, including Instagram, Google Maps, Amazon and eBay, its unclear if this display real estate shift will bring more app creators back into the fold, but there’s still a possibility it could. Other changes include the Digital Crown now featuring haptic feedback, giving the wearer a tactile sensation as they scroll through watchOS 5. While far from a necessity, I’ve quickly grown fond of the Apple Watch Series 4’s haptic feedback. Apple says that some aspects of the Digital Crown’s new haptic feedback functionality will be open to third-party developers, but it remains unclear how much control they’ll actually have over it. The controversial red circle placed on the side of the Digital Crown with the Apple Watch Series 3 has also been transformed into a thin red rim running around the circumference of the scroll wheel. Though I wasn’t averse to the red-coloured Digital Crown, those who hated it will appreciate this subtle design shift. Other new Series 4 features consist of additional Watch Faces that include expanded Complications designed to take advantage of the Series 4’s larger display. To be clear, the new eight-Complication infograph Watch Face looks incredibly nerdy and is the opposite of minimalist and sleek. That said, as someone who often uses the Apple Watch for at-a-glance information, I find the Infograph Watch Face useful and appreciate that it takes full advantage of the Series 4’s more expansive screen. Hopefully, Apple releases more similar Watch Faces in the future. It would also be great to see Watch Faces being opened up to third-party developers. The Series 4’s other new animated watch faces — Fire, Water, Vapor and Liquid Metal — are cool to look at but aren’t images I’d like to have featured on my wrist at all times. Other changes to the new Apple Watch’s design include the fact that the wearable’s body is now slightly thinner when compared to its predecessor. It’s also worth noting that all previously released Watch Bands fit perfectly with the new 40mm and 44mm sized Apple Watch, which is an impressive engineering feat on Apple’s part. Overall, even though the Apple Watch Series 4 still features a rectangular face, I’d argue that it looks more like a standard watch than earlier editions of the wearable. As expected, the Series 4 features a sizable power bump thanks to Apple’s new S4 64-bit dual-core CPU and GPU chip, resulting in two times faster performance when compared to the S3, according to Apple. Although running apps on the Apple Watch hasn’t ever been — and likely never will be — my primary use for the wearable, in my tests the Series 4 performed smoothly. Further, Apple has also packed a new W3 chip in the smartwatch that’s capable of delivering faster Bluetooth 5.0, allowing content like music, podcasts and app updates to transfer to the watch faster. 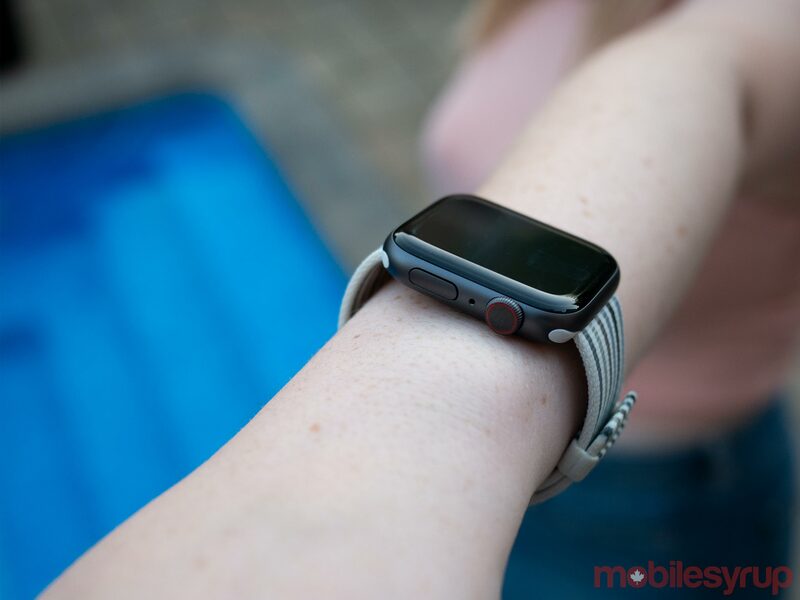 As a result, software updates, as well as transferring Apple Music songs to the smartwatch’s internal storage, are slightly quicker than they were on the Apple Watch Series 3. Though it’s great that the Apple Watch is considerably more powerful than its predecessor, I primarily use the Series 4 as a notification triage device, as well as a way to disconnect from my smartphone while still being able to see notifications that matter to me. This means that in my particular use case, the power bump doesn’t mean much, though I do appreciate that the overall experience with the Series 4 is smoother as a result. Of course, the LTE connectivity Apple brought to the Apple Watch with the Series 3 is back and works just as well with the Series 4. 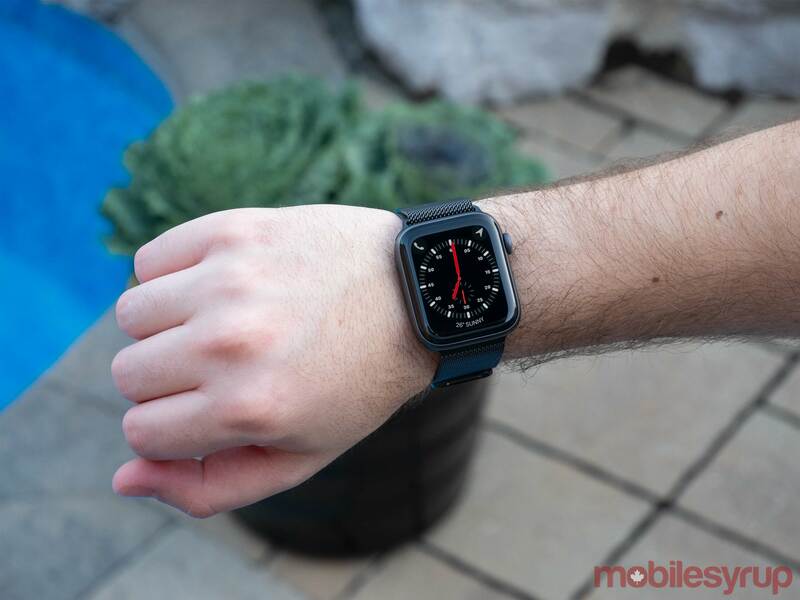 More Canadian carriers have signed on to offer Apple Watch LTE add-ons, too, with Rogers finally joining Bell and Telus, though specifics haven’t been announced yet. While I haven’t found LTE connectivity to be particularly useful with the Apple Watch, I can see why it would appeal to some users, specifically those who like to go out running but still want to remain connected. Apple has also improved the Series 4’s built-in speaker to be 50 percent louder, which helps with hearing phone calls from the watch, and moved the mic to sit between the wearable’s home button and digital crown, reducing echo on phone calls. I found that battery life remains pretty much the same as my experience with the Series 3, with the Series 4 lasting roughly a day and a half after moderate use. 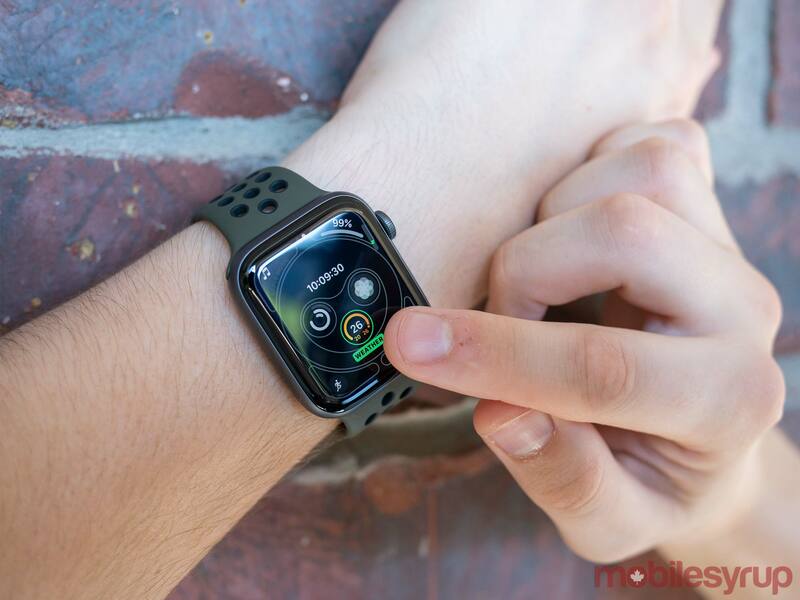 While an optical heart sensor has been part of the Apple Watch since its inception, the Series 4 brings a new electrical heart sensor to the wearable. The electrical heart sensor consists of electrodes built into the Digital Crown, as well as the smartwatch’s new black sapphire crystal rear. The tech combines to give users three new heart rate related features: low heart rate notifications, irregular rhythm notifications and a dedicated ECG app that has been approved by the FDA. While the low heart rate feature, which utilizes the Series 4’s optical heart rate sensor to detect if your heart rate is below a specific threshold, along with the similar irregular rhythm notification functionality, are great additions on Apple’s part, ECG won’t be available when the Series 4 launches on September 21st. It’s also worth pointing out that low heart rate notifications and irregular rhythm notifications will be available on all Apple Watches, even the Series 1. The dedicated ECG app — which, to Apple’s credit, is the first of its kind in a consumer wearable — is releasing later this year, according to the tech giant. 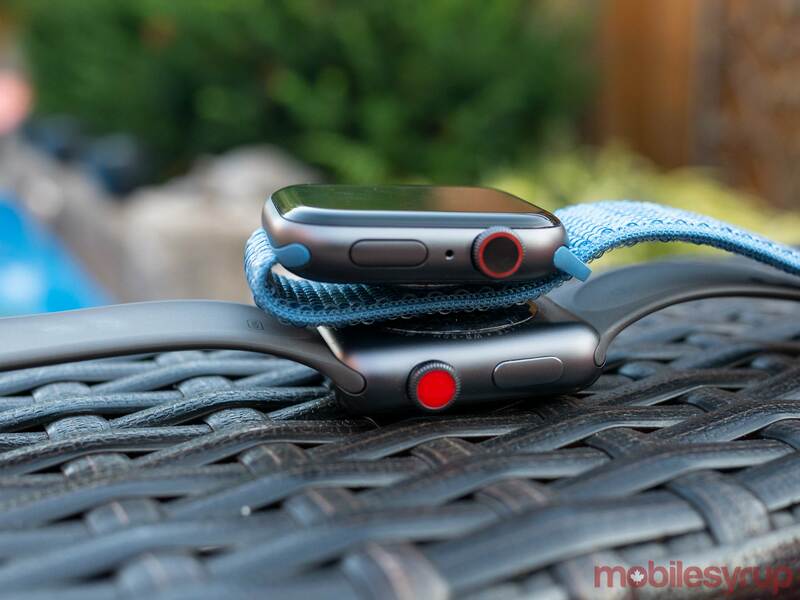 Concerning a Canadian release, Apple said that it’s currently in the process of working with Health Canada to bring the functionality to the Canadian market, though the medical regulatory body said that it “has not yet received a medical device application for the Apple Watch Series 4 with EKG feature,” in a recent tweet from the @GovCanHealth Twitter account. 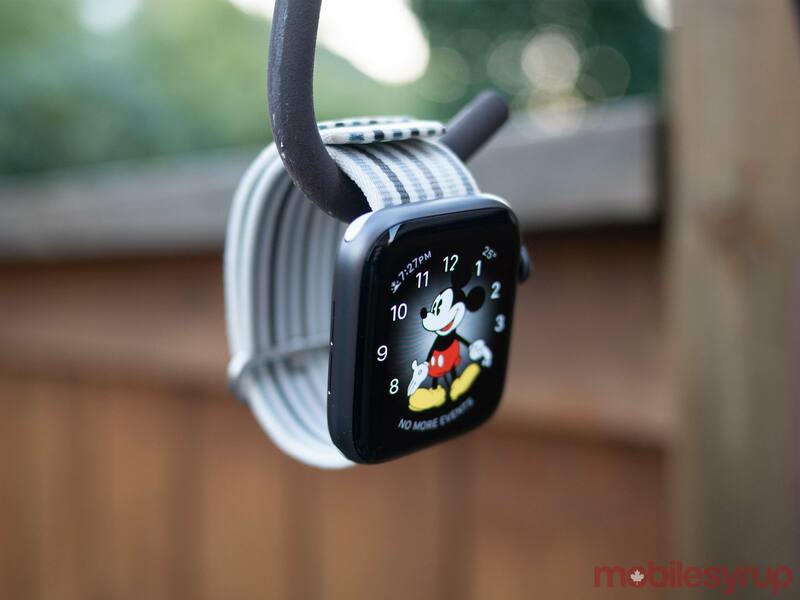 Given that Health Canada often takes cues from the FDA, although the Canadian regulatory body is sometimes more cautious, it’s likely that at some point ECG will be available in the Apple Watch Series 4. As it stands, though, it’s unclear when the feature will launch. Another health-related feature that’s exclusive to the Apple Watch Series 4 is Fall Detection. While this functionality won’t be useful for everyone, I can think of many situations where it could help save lives. For example, my mother often goes for walks in her rural neighbourhood, even in the dead of winter. If she happened to accidentally fall and wasn’t able to get up, a hard fall alert is sent to the watch, allowing the wearer to initiate an emergency services call from their wrist easily. 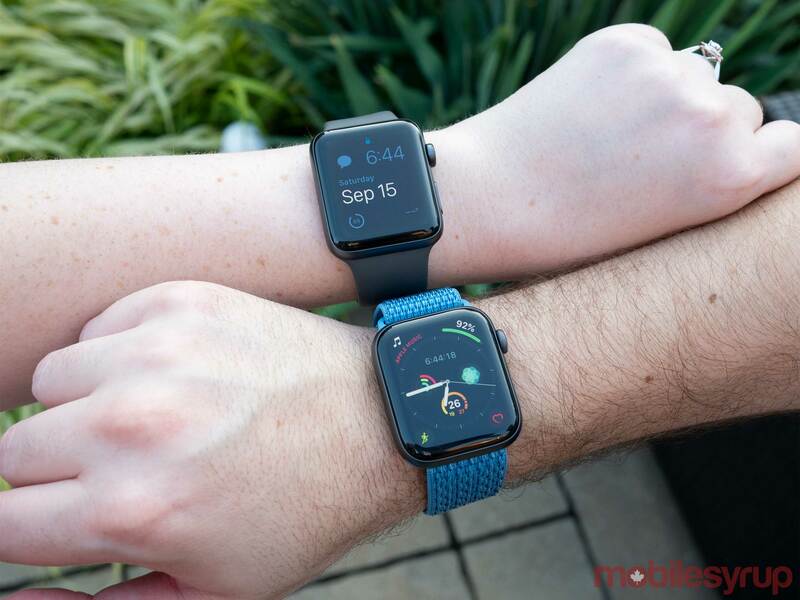 Though many of these improvements are specific to the Apple Watch Series 4, watchOS 5 brings many great features to the wearable. For example, podcasts can now be streamed straight to your wrist, similar to Apple Music — a feature I’m surprised wasn’t already part of the Apple Watch. Apple’s Workout app is also significantly smarter now and can automatically detect a variety of workout types. This means that if you’re like me and often forget to launch a workout when you’re exercising, the Apple Watch will automatically detect the activity and corresponding workout. Further, after you’ve finished your workout and your heart rate decreases, an alert is sent out that ends the exercise. This feature is excellent, but it did take a few minutes to launch in my tests. Other fitness-focused watchOS 5 additions include Apple’s take on Fitbit’s ‘Community’ feature. Users can challenge friends to “win the week” by earning a specific amount of points and closing their Rings. These challenge requests are sent to friends in your contact list and must first be accepted before a seven-day long competition launches. I won’t go into every new watchOS 5 feature, but there are a lot, including Walkie-Talkie, a fun way to send audio clips to friends, setting a target pace during running and workouts, improvements to Siri, and better notification management. Update 09/21/2018: Updated with more information about the Apple watch Series 4’s ECG feature making its way to the Canadian market. The Apple Watch Series 4 is by far the best smartwatch on the market and the most significant improvement to the wearable since its launch. Through repeated refinement, especially on the operating system side of things, Apple has managed to define what the modern smartwatch is. 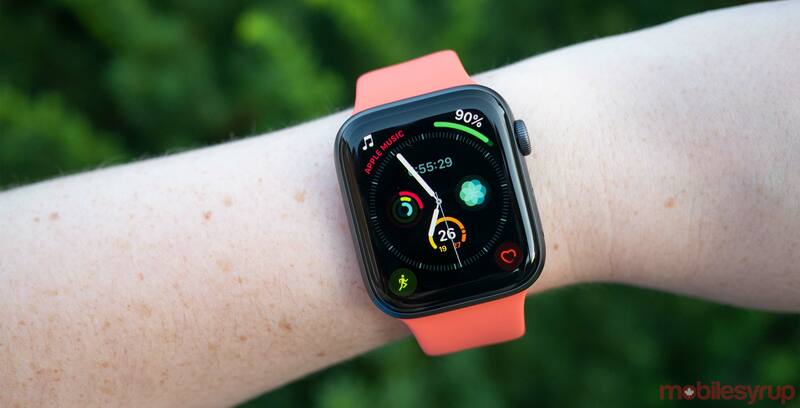 Rather than a device designed to replace your smartphone, the Apple Watch is a companion that features expansive health functionality and delivers notifications to your wrist. 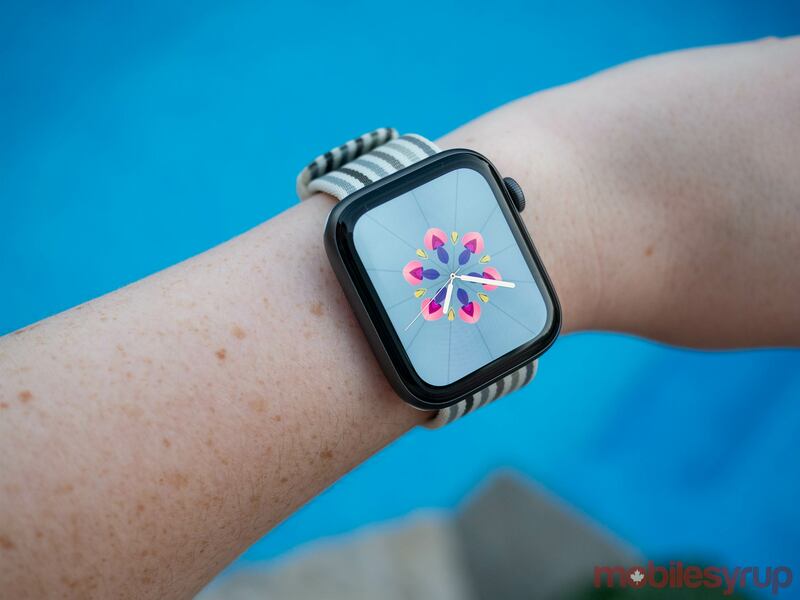 In many ways, the Series 4 is a sign that Apple's smartwatch has finally hit its stride, though questions remain regarding whether the Apple Watch's innovative ECG feature will make its way to Canada. Thanks to an expanded display and slightly modified design, the Series 4 is also the sleekest smartwatch out there. 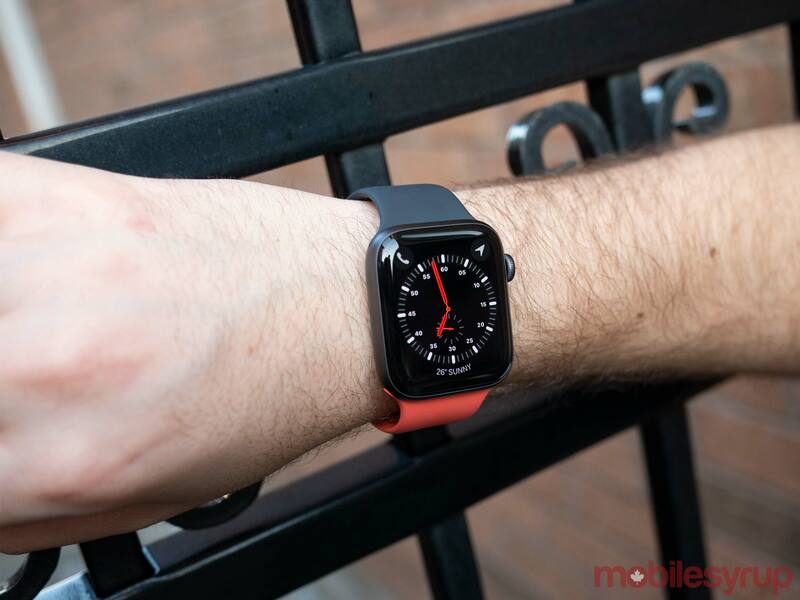 The Apple Watch Series 4 ranges from $519 CAD for the 40mm base model Series 4 with GPS and a Sport Band, to $1,119 CAD for the 44mm cellular stainless steel gold option with a Milanese Loop. "Through repeated refinement, especially on the operating system side of things, Apple has managed to define what the modern smartwatch is"